Mix ingredients and whip together. Set aside. Place the pecan halves on a cookie sheet and bake for about 10 minutes in a 350° preheated oven. (Mix them in the pan midway through so they get roasted evenly.) Remove from oven and set aside to cool. Crumble or chop the halves a bit. 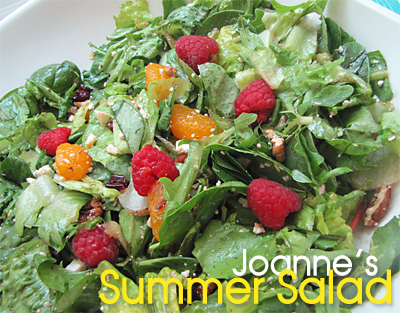 In a large bowl, empty the containers of romaine mix and baby spinach. Add the feta, Craisins, black pepper, and the pecan pieces. Drizzle in some of the dressing and start tossing to coat ingredients lightly. (Unless you’ve taught your greens how to swim, you won’t be using all of your dressing, so just add a little at a time.) Add more dressing to taste, tossing after each addition. Last, add the Mandarin oranges and very lightly toss to mix them in, being careful not to mash up the orange pieces. Sprinkle the fresh raspberries on top.